FREE FABULOUS CHRISTMAS GIVEAWAYS for our LUCKY customers!!! 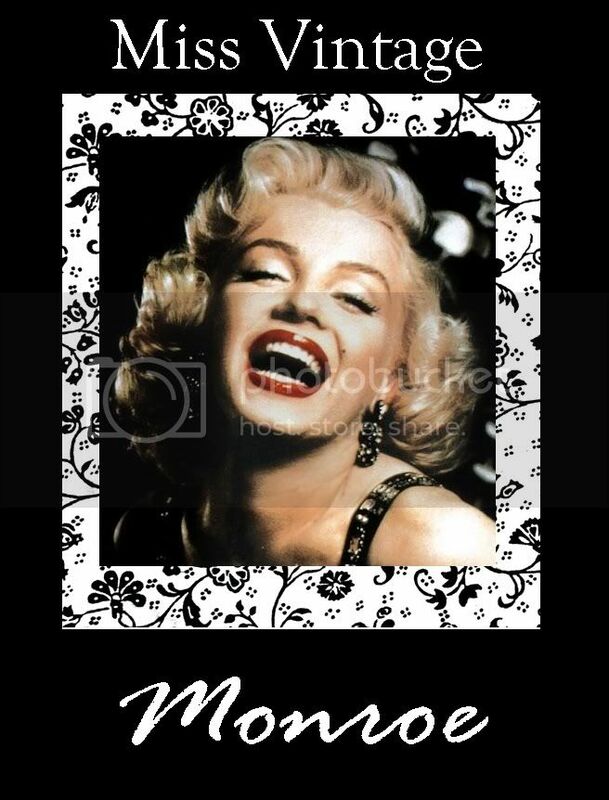 Glossy Amor is giving out FREE FABULOUS CHRISTMAS GIVEAWAYS TO TWO LUCKY CUSTOMERS!! 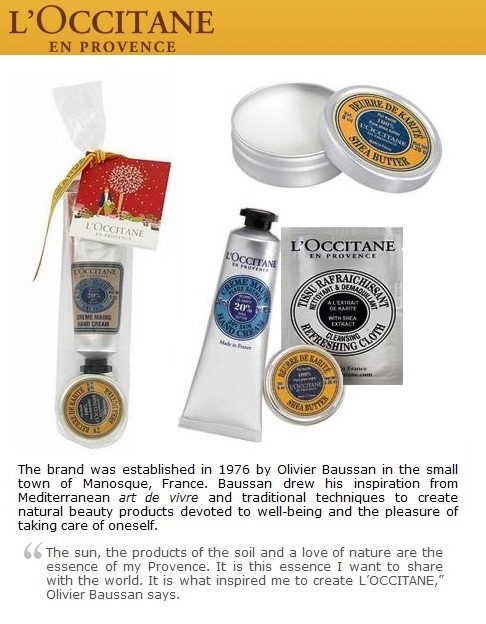 Fabulous giveaways are items from ANNA SUI and L'OCCITANE EN PROVENCE. 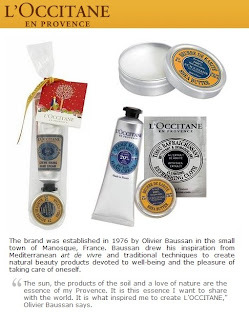 1)Purchase any product from Glossy Amor starting 21st November 2010 till 21st December 2010. 2) BE a follower in Glossy Amor. DIVA'S DIVINE is giving away Christmas Presents to 5 lucky girls!!!! 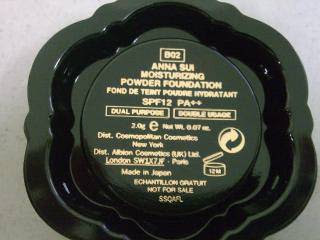 As what have mentioned from previous blogpost, we are featuring items according to their COLOUR!!! This time around we have RED! Capturing floral dress from Moiselle Made, with red and yellow flowers print on the dress, V-shaped neckline with ribbon sew at the upper body! Isnt it just feminine? Stealing from Colour Chaos, this fitting tank-top like pieces can actually be a mini dress for petite ladies! The interesting part is the back part of the dress with bows that make it unique! Grab this mini top red cardigan from Girls In Mode! When hot girls are in the vibrant mode! Match this cardigan with plan tube, it will be a perfect match! From Beg Berry, Estee Lauder PVC Make up Bag with about Length 22.8cm x Height 13.8 x Width 5.5cm which allows you to have all your makeup babes protected from water if spilled! 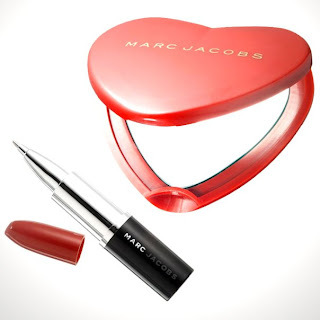 Shop For Love Fashionista have this lovely heart-shaped cosmetic mirror and special edition of red lipsticks pen from Marc Jacobs! Mini size of 3 inches made of with 1 standard mirror and 1 magnify mirror when open up! Get it here rather then MJ headquarter! 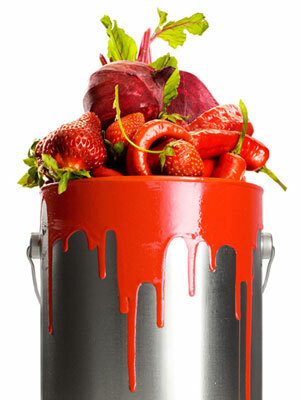 Colour Food Series - RED! Colour Your Health By Colouring Your Meals! Do you know that various food colour have their own function in manipulating our heath? Came across an interesting article that featured the benefit of different colour of food and their nutrition content and how we can take in! In conjuction with the "Colour" Season, will feature each colour and latest update of same colour series of updates from the online entrepreneurs! So Stay tune!!! Be Fashionable and Be Healthy! Think black is slimming? Try red, green, and yellow. When it comes to fruits and vegetables, a more colorful plate benefits your health and waistline. We'll show you what to eat in every color for your healthiest you. The latest research shows that one of the best ways to lose weight and boost your health is to eat a host of colors. Trouble is, most of the people don't consume enough of a variety of colorful fruits and vegetables, which means they face a nutrient deficit, according to a recent analysis of data from the National Health and Nutrition Examination Surveys and the USDA. Here's a kaleidoscope of inspiration to punch up your next meal. Move over, Wheaties. The new breakfast of champions is red chili peppers -- seriously. People whose morning meal included the spicy vegetable were less hungry after breakfast and ate less fat at lunch, a study in the British Journal of Nutrition found. "Capsaicin, the compound that gives peppers their bite, increases the production of appetite-suppressing hormones called catecholamines," says Sasson Moulavi, MD, a physician in Boca Raton, Florida, who specializes in weight control. Fresh idea: Add diced red chili peppers to scrambled eggs or top a whole wheat English muffin with low-fat ricotta cheese and chopped chilies. Brush, floss...and snack on strawberries? Yup. It turns out that the fruit contains salicylic acid, a natural tooth whitener. "Strawberries are a potent plaque fighter, and they actually contain a mild bleaching agent that's used in many commercial products," says Janice Cox, coauthor of Eco Beauty. Fresh idea: Puree a handful of fresh strawberries and add it to iced green tea. Go longer by tossing beets into your salad. Researchers discovered that this vegetable helped cyclists increase their endurance by up to 16 percent. "Beets seem to reduce the amount of oxygen the body uses during exercise," says exercise physiologist Stephen Bailey of Exeter University in England. "The result is muscles that can tolerate high-intensity exercise longer." Fresh idea: Drizzle beets with red wine vinegar and olive oil, then roast. Or saute with onions and garlic. The foxy fur tail bag worth RM98!! and more!!! 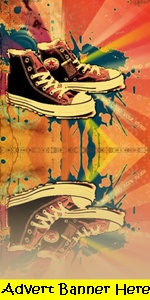 by creating a CREATIVE Banner!!! Organized by Baby Dazzled, the competition is called the 'Creative Banner Competition'. How to enter this competition? The available prizes are the same which is the foxy fur tail, design 8 bracelet, thomas sabo bracelet and badges. So now first prize winner can choose one of the prizes followed by the 2nd and 3rd. And also please state that the judging is mainly on the catchy slogan such as 'Baby Be Dazzled, dazzling my world' and not the picture. So send in any catchy slogans will do! Win iPad for Yourself E-Seller!!! GREAT NEWS!!! I ♥ Bazaar Contest is launched JUST FOR YOU!!! Join as a vendor at any of our bazaars (I ♥ Bazaar @ Subang Parade & I ♥ Bazaar @ TCM) to stand a chance to WIN AN APPLE IPAD! to participate in this contest. 1. Voting will end at 5pm on Dec 20th 2010. 3. The Organizers of I ♥ Bazaar reserves the rights to amend or update the terms & conditions at any time without prior notice. 4. Each participant agrees to be bounded by the Official Rules and that the decisions of the Organizers shall be final and supersedes all terms & conditions. No appeals shall be entertained. Good luck to all participants and have fun! RylDesigns is looking for NEW, potential bazaar venues to further promote your brand and products!! Located at the heart of Petaling Jaya, surrounded by fully occupied housing estates, condominiums, offices and colleges, directly visible from most major highways (LDP, SPRINT, NKVE), RylDesigns would love to invite you to be a part of us in this event. 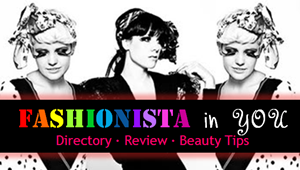 Please log on to our website http://ilovebazaar.net for more details about I ♥ Bazaar. Please feel free to drop us a mail at ryl.designs@gmail.com for any other inquiries. For ladies out there who is celebrating DeepaRaya, here are some fashion suggestion to live up on your upcoming festive!! With the GREEN as our theme, we proposed to you, choice that you can make for your relative visit or open house! Paired it with a skinny jeans if the dress too short for you! Not jeans? What about printed leggings? Open toe gladiator wedges, not only for function, is also comfy for your normal daily wears! Accessorized your plain dress with a brooch.Suggested brooch is fabric linen flower brooch with crystalized design! Simple elegant.